Dawn of the Planet of the Apes arrives with the unfortunate disadvantage of high expectations. That certainly wasn’t the case for its predecessor, Rise of the Planet of the Apes, which landed in 2011 with an iffy early August release date, relatively late screenings for critics and the residual ill will induced by Tim Burton’s botched 2001 reboot, Planet of the Apes. As it turned out, not only did Rise have nothing in common with Burton’s vision, it was a surprisingly thoughtful, well-crafted and genuinely exciting example of the Hollywood blockbuster. Dawn, by contrast, opens amid a tidal wave of hype and positive buzz from early screenings. It has already been designated one of the biggest movies of the summer, and smartly positioned as an ideal remedy for the depressing hangover of the latest Transformers debacle. And in many ways, this confident, compassionate, visual spectacle made with good taste and good intentions is everything we should all expect from the highest caliber of Hollywood filmmaking. Except in the ways that it isn’t. Dawn is a beautifully designed mixed bag. A step forward from Rise in several areas, and a step back in others. It’s a good film, and if you enjoy action or sci-fi movies or keeping up with the latest advances in “How the hell did they pull that off?” visual effects, you should definitely see it. But in comparison to the fun and surprises of Rise, Dawn can’t help but feel a little self-serious and predictable. It’s a parable that strives to be an epic. Ascendant director Matt Reeves (Cloverfield, Let Me In) evidently has the ambition to equal The Empire Strikes Back or The Dark Knight when it comes to genre sequels, and even though the film falls considerably short of those lofty goals, you can’t fault him for trying. Set roughly a decade after the events of Rise, heroic chimp Caesar (Andy Serkis, reprising his justly lauded performance-capture role) has established an Ewok-style primate paradise in the lush forests outside San Francisco. It’s an apparent utopia where the golden rule is “ape do not harm ape,” communication happens via sign language and the existence of humans, largely wiped off the planet by the virus introduced in Rise, is a distant memory. For some, that memory is more of a nightmare—including Caesar’s longtime frenemy Koba (Toby Kebbell), who has never been able to forgive the evils inflicted upon him in human captivity. Caesar’s peaceful kingdom is disrupted by the sudden appearance of a cartoonishly hateful human survivor (Kirk Acevedo), who fires a single shot that lays the foundation for full-blown war. To the film’s credit, its depiction of the inevitability of warfare between the few remaining humans and unexpectedly dominant apes is slightly more nuanced than the average blockbuster. While the human characters are never very interesting, there’s a genuine attempt by screenwriters Mark Bomback, Rick Jaffa and Amanda Silver to give equal consideration to both sides of the conflict in what otherwise might have become The Walking Dead with humans filling the role of zombies. 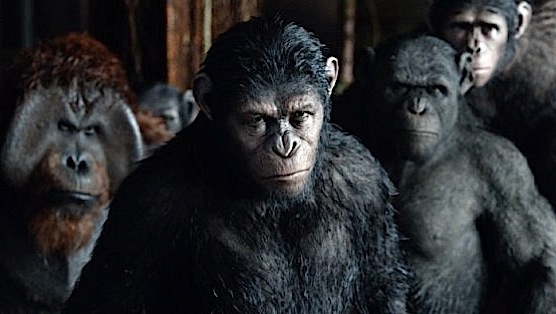 The film very clearly doesn’t want to portray either side as more justified or superior than the other (even if, by default, you’re ultimately rooting for the apes), and instead aims to reveal the good and bad elements present in both. Where Dawn excels is not in the script’s simplistic portrayals of the complex dynamics of tribal warfare, but in good old-fashioned Hollywood razzle-dazzle. (Just skip the unnecessary 3D if you can.) Much will be made of the great advances in performance-capture technology on display here—even greater than the Oscar-nominated breakthrough visuals in Rise—and yet the remarkable achievements can hardly be overstated. Filmed primarily in actual locations as opposed to traditional sound stages, the vibrant ape community feels so authentic you’ll swear you could book a ticket to visit immediately after leaving the theater. And there’s barely a frame of film that suggests the primate cast is anything less than the real deal, despite the staggering fact that they only come to life through a masterful collaboration of performers, stunt people and visual effects. Lord of the Rings veteran Serkis has already earned his crown as the king of motion-capture performance work, and since Caesar is the center of this sure-to-be-ongoing franchise, it’s easy to single him out for top honors. Kebbell proves every bit as capable in realizing the considerably less endearing Koba, and Nick Thurston has a few stunningly expressive scenes as Caesar’s eldest son, Blue Eyes. Unfortunately, the same can’t be said for talented character actress Judy Greer, relegated to a depressingly mundane mo-cap role as Caesar’s ailing wife. In fact, Dawn is bizarrely dismissive of women overall—poor Keri Russell, so incredible in FX’s The Americans, is similarly squandered in a part that might as well be called Missus Nice Lady—and it’s the single biggest problem one hopes will be addressed in the inevitable threequel. Because yes, we’ll get one. For all the flaws of character and narrative, Reeves has crafted a movie of nearly nonstop forward momentum, and that alone should be enough to ensure its success. It’s visually compelling, never drags and benefits from ace technical contributions from the likes of cinematographer Michael Seresin (Harry Potter and the Prisoner of Azkaban) and composer Michael Giacchino (an Oscar winner for Up who also collaborated on Reeves’ terrific horror remake Let Me In). Yes, Dawn of the Planet of the Apes is a good film. I wish it was a great one.